Turkish police made two arrests while dispersing peaceful protesters outside a meeting between U.S. Secretary of State Rex Tillerson and Turkish Foreign Minister Mevlüt Çavuşoğlu, opposition newspaper Cumhuriyet said. 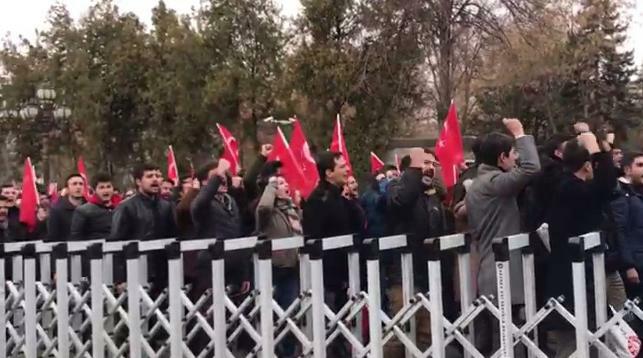 The protest outside the Ankara Palace Hotel, where the talks were held, had been called by the left-nationalist Patriotic Party. The demonstrators shouted slogans including “The U.S. is the killer of the Turkish soldier,” “Murderer Tillerson,” “Down with U.S. imperialism”. Around 100 riot police used tear gas to disperse the protests, Cumhuriyet said. Another political party, the left-wing People’s Liberation Party (HKP), also faced a police intervention while protesting Tillerson’s arrival in Ankara yesterday. Police chased the group back to the party’s offices, and used tear gas there, Cumhuriyet said. Vatan Partisi Öncü Gençlik üyeleri, ABD Dışişleri Bakanı Rex Tillerson'u Ankara Palas'ta Dışişleri Bakanı Çavuşoğlu ile görüşmesi sürerken protesto etti. Polisin müdahale ederek dağıttığı eylemde iki kişi gözaltına alındı.